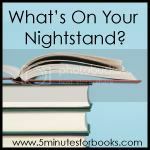 It's time AGAIN for What's on Your Nightstand over at 5 Minutes for Books. WHERE did the time go already? It hardly seems fair. I'd complain more if Christmas weren't just a couple of days away but currently I'm too excited about that to notice much else. It's time to CELEBRATE so I really don't have many grand Nightstand Plans, if you will, as I'm taking a short reading break during the holidays. That being said, I'll share about a few books which are beckoning to me. 1. How to Be Like Walt: Capturing the Disney Magic Every Day of Your Life . I've briefly skimmed this book and the man sounds fascinating! I'm really looking forward to getting into this one! Books that I'm hoping to read for personal pleasure. 1. Book Two of Edmund Spense's Faerie Queen. I read Faerie Queen Book One and I just need to get my act together and move on. 2. Lots and lots and lots (and lots and lots) of re-reading Lucy Maud Montgomery's books just for the plain fun of it! Because it just needs to happen! Just because it's fun. That's what's hanging around on my "nightstand" this month. What about you? I know everyone is getting ready for Christmas but I'm hoping to see some of you around this week anyway. In the meantime, I hope everyone has a wonderful holiday season! December is flying, the whole year really. How to be like walt sounds interesting. Good list. I've never read the Lucy Maud Montgomery books but now I'm intrigued. Merry Christmas. Thanks for stopping by. I have read LM Montgomery in quite some time. Carrie, I nominated you for a blog award: http://dwell-in-possibility.blogspot.com/2008/12/blog-award-nomination-kreativ-blogger.html. the How To Be Like Walt one sounds pretty cool! I dearly want to reread some of L.M. Montgomery's books as well as Jan Karon's. So many good books, so little time!! The Walt Disney one sounds great. Love Walt! L.M. Montgomery books are so much fun! I'm thinking I may need to read one or two next year just for fun. It's been a long time since I've read them, but Rilla of Ingleside is my favorite. Okay, I'm sold on L.M. Montgomery! I am sold on the Walt Disney one! I'm putting it on my list RIGHT NOW! Happy reading!